GOSHEN – The third time really was the charm for the NorthWood girls tennis team Saturday. The Panthers reversed regular-season fortunes to down Fairfield 3-2 to claim the championship of the Goshen Sectional. NorthWood, which lost 3-2 to the Falcons twice during the regular season, advances to play Fremont (9-5) in a semifinal match of the Northridge Regional Tuesday at 5 p.m. Fremont beat Prairie Heights 5-0 Friday to win the Angola Sectional title. 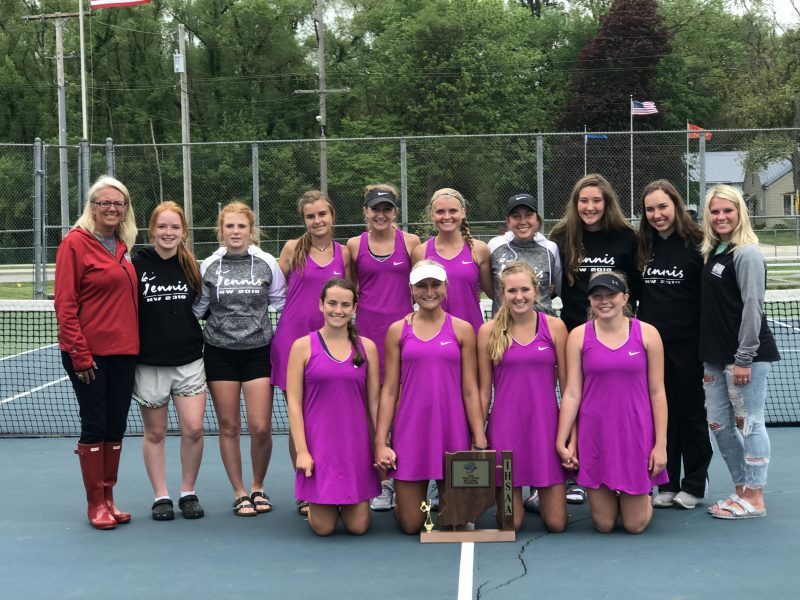 The other regional semifinal Tuesday pits Concord (11-3) versus Central Noble (10-3), also at 5 p.m. Concord topped Northridge 5-0 to claim the Northridge Sectional title Thursday, while Central Noble defeated Westview 3-2 to win the West Noble Sectional crown Saturday. The regional final is scheduled for Wednesday at Northridge at 5 p.m. with the winner earning a spot in the Homestead Semistate on May 26 to face the Marion Regional champion. NorthWood claimed the fourth sectional title in program history and its second straight after having to wait an extra day. The title match was postponed due to rain Friday evening before being played Saturday at Goshen Middle School. The Panthers clinched the championship Saturday on a win on the No. 3 singles court by Gretchen Adams. The junior topped senior Alexandra Swank 6-2, 5-7, 6-1 to give her team the final point. NorthWood was not at full strength or with its normal lineup intact for either earlier meeting versus Fairfield earlier this season. No. 1 singles player Alex Jesse missed the first meeting in the season opener on April 10 due to a leg injury. Jesse was playing at No. 2 doubles when the Panthers lost 3-2 to Fairfield on May 4 in the Culver Academy Invitational. “Obviously, we wish that we would have had Alex all season,” said Schwartz of her sophomore, now in her second year at No. 1. “Our singles lineup has improved tremendously with her back in it. It definitely though made our team a lot stronger all the way around. With her out, our girls had to play up with Reegan (Miller) and Gretchen having to play 1 and 2. Schwartz said that Adams was ready to go despite losing her second set. Adams had defeated Swank 3-6, 6-4, 6-2 at No. 2 singles play the first time the two teams met in April. Adams, who had rallied from a 4-1 deficit in the second set before losing, won the first five games of the final set. Adams was an alternate a year ago when the Panthers claimed the Goshen Sectional crown. NorthWood got an expected point from its leaders in Kennedy Wiens and Betsy Nunemaker at No. 1 doubles. The pair topped juniors Madison Cole and Kylie Miller 6-2, 6-2. Wiens and Nunemaker are the lone two seniors in the lineup. The outstanding duo are half of the four returning letter winners from last year’s team that went 14-4 and lost to Concord 5-0 in the regional. NorthWood also got a win from junior Reegan Miller at No. 2 singles. Miller topped senior Sidney Hochstedler 6-1, 6-0. The Falcons prevailed at No. 1 singles and No. 2 doubles. Standout ace Morgan Mast, who is headed to play at Grace College, beat sophomore Jesse 6-2, 6-0 at No. 1 singles action. The team of sophomores Riley Miller and Madeline Gawthrop beat sophomore Lauren Mikel and junior Riley Graber 6-0, 6-3 at No. 2 doubles play. Fairfield improved greatly after going 10-10 a year ago. The Falcons had nine returning letter winners this season. NorthWood earned its spot in the final with a 4-1 semifinal win over Bethany Christian Thursday. The Panthers, who also won sectional titles in 2007 and 2009, now take an 11-6 mark into regional play. The Panthers are also one of four NLC teams to claim sectional championships. NorthWood, which finished fourth overall in the NLC, joins Warsaw, Plymouth and Concord. Warsaw beat fellow NLC member Wawasee 5-0 Friday to win its own sectional for the 18th straight year. Plymouth blanked Bremen 5-0 Saturday to win the Bremen Sectional crown.